As we all know, tires aren’t exactly a “one size fits all” product, and it makes choosing the right size a bit complicated if you don’t already have a passing grade in Tire Size 101. One size that does offer universal fitment for many makes and models is 600-16. While this particular bias ply tire size doesn’t fit any modern vehicles, it covers a wide range of antique American and European automobiles, trucks and military vehicles. And because of its rich history during the 1930’s and 1940’s, the popular 600-16 tires are often used on hot rods and customs. Without question, 600-16 whitewall tires are the most popular choice, but blackwall versions are available for more industrial applications. According to our records, the earliest usage of the 6.00-16 tire size dates back to 1933. At this time, American automobiles were going through a transition period, with more extravagant body lines, luxurious interiors and additional creature comforts. One big changes involved tire and wheel size. Gone were the days of large-diameter rims with wooden spokes, and wire spoke wheels were downsizing year-by-year. For instance, Ford used a 21-inch wire spoke wheel for its 1928 and 1929 Model A, and stepped down to a 19-inch wheel for 1930, then an 18-inch wheel in 1932, 17-inch wheel in 1933, and finally 16-inch in 1935. 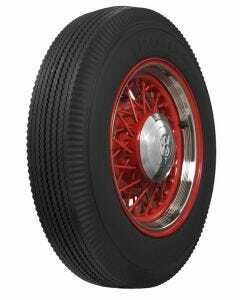 The 16-inch wheel set the standard for American automobiles, and remained the standard through the late 1940’s. For more than a decade, 600-16 tires rolled beneath millions of cars and trucks. That’s what makes 600-16 the most popular tire size in our line of authentic whitewall tires. In the 1930’s and 1940’s, dozens of tire manufacturers offers 600-16 tires. Some were original equipment, while others were available from local service centers and tire shops. It was also commonplace for service centers and special tire shops to offer retreading services, which involved “recapping” the tire with a new tread surface. Recapped tires are not ideal for passenger cars, so this service was phased out as tire cost dropped. In fact, modifying tires in any way has offered a bad track record for longevity. That’s why any whitewall tire from Coker Tire is made from day one with the whitewall built in to original tire carcass. We don’t believe that modifying a tire to apply a whitewall or other special sidewall is worth the risk to you or your classic automobile. Our 600-16 tires feature a true and authentic whitewall construction that is built for reliable service. The late 1940’s saw another big transition in the automotive world. Bodies were once again changing, and auto manufacturers developed independent suspensions, many V8 engine designs and other features to make long distance driving more pleasurable. Part of this transition included another tire and wheel downsize to 15-inch wheel diameters. This was standard from about 1949 to 1957, when the industry downsized again. But the 16-inch wheel, and 600-16 tire size remained standard for many trucks and military vehicles through the mid 1950’s. We have touched on major American automobile manufacturers, such as Ford, Chevrolet and Dodge, but it’s important to note that 6.00-16 tires were used on many European cars, such as Ferrari, Aston Martin and Jaguar in the 1950’s. It’s also important to remember that 6.00-16 tires were used on larger, more luxurious cars, such as Chrysler, Hupmobile, and Oldsmobile. 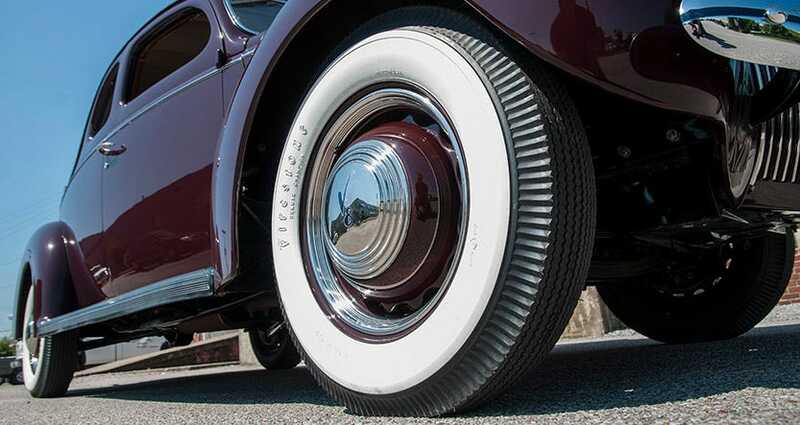 In fact, 600-16 tires were used on standard Auburn models from 1934 to 1937. Auburn Deluxe models used larger tires such as 6.50-16 and 7.00-16. Authentic 600-16 tires from Coker Tire range in brand, construction, whitewall width and price. We offer bias ply versions of the popular 600-16 size, which offer perfectly authentic appearance and ride quality. We build the tires in original molds, which we refurbish to modern standards before putting them back into production. All of our 600-16 tires are thoroughly tested and DOT approved before entering the marketplace. Bias ply 600-16 tires from Coker Tire are available in Firestone, BF Goodrich, Coker Classic and Excelsior. Coker Tire also offers 6.00-16 tires with original-style sizing and dimensions, combined with the construction of a modern radial. 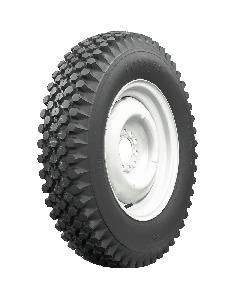 The Coker Classic Bias Profile Radial product line offers five 16-inch radial sizes, ranging from 5.50R16 to 7.50R16, including the very popular 6.00R16 tire size. 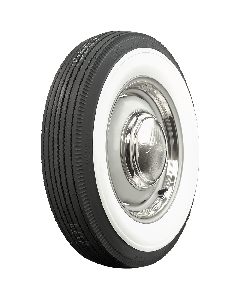 Coker Classic radials are available in wide whitewall and blackwall sidewall styles, offering a wide range of fitments and applications, from restored stock antique cars to classic trucks and hot rods. 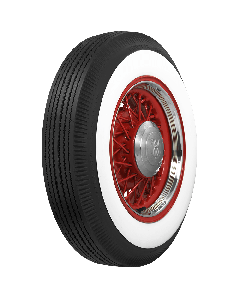 Coker Tire introduced the Coker Classic wide whitewall radial in 1995, so it is a well-established product line with more than 20 years of research and development. 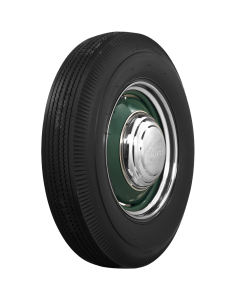 Coker Classic radial tires are DOT and ECE approved and are the perfect replacement for original bias ply tires. Additionally, Coker Tire offers other blackwall radial tires in popular 6.00R16 sizing. Excelsior Stahl Sport radial tires offer the vintage “tall and skinny” profile of a bias ply tire, but feature the safety, ride quality and tread life of a modern radial. Excelsior Stahl Sport Radial tires are available to fit many 16-inch wheels, as well as larger diameters for other pre-WWII applications. Other 600R16 fitments include a Michelin Pilote X radial tire, and a popular tire size conversion for European automobiles is 185R16, which is available in our Firestone, Vredestein, and Michelin lines. There is not currently a P-metric radial tire that offers exact sizing to original 600-16 tires, so tire size comparison is tough to nail down. In conclusion, Coker Tire has it covered if you need a 600-16 tire for your automobile. Whether you want bias ply or radial, whitewall or blackwall, Coker Tire offers several brands and price points to suit your needs. And with decades of experience in whitewall tires, Coker Tire can keep your classic car on the road with reliable, authentic and reasonably priced 600-16 tires.